South Korea’s current account surplus shrank in February compared to the same month last year due to the narrowed surplus in goods account on reduced exports of chips and petroleum products. 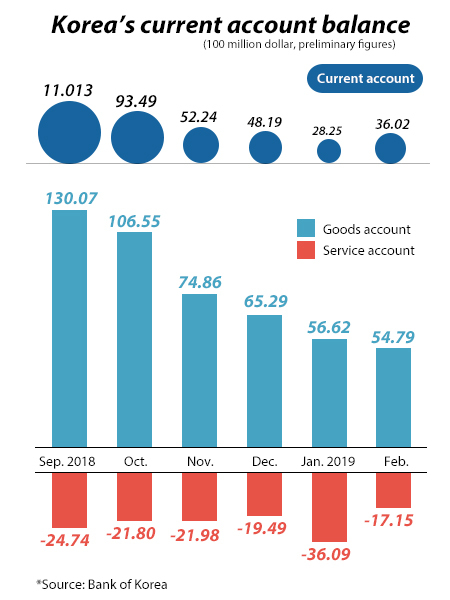 According to preliminary balance of payments data released by Bank of Korea on Thursday, the country’s current account surplus reached $3.6 billion in February, maintaining the surplus streak for 82 consecutive months since May 2012. The figure expanded compared to the previous month when it had recorded $2.82 billion won, but narrowed from the same month last year with $3.9 billion. The goods account surplus came to $5.48 billion in February, the lowest since July 2014 as exports came down 10.8 percent on year to $40.13 billion. The country’s outbound shipments slipped for the third straight month due to the falling chip prices, reduced exports of petroleum products and sluggish demand from China. The current account kept up black figure as the nation’s imports showed a bigger drop than exports. Imports decreased 12.1 percent in February from the previous year to $34.65 billion, the largest on-year fall since July 2016 due to the drop in global crude prices and reduced imports of machinery. Service account deficit significantly decreased to $1.72 billion from $2.61 billion in the same month a year ago. Thanks to the increased visitors from China and Japan, the deficit in travel account shrank to $1.14 billion from $1.42 billion over the same period. The number of Korean outbound travelers fell 10.1 percent to 2,618,000. The surplus in primary income account slumped to the lowest in six months to $360 million in February due to the expanded dividend payouts to foreign investors. In the financial account, net assets grew $3.43 billion.